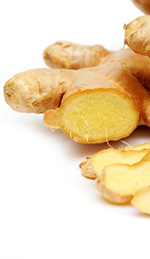 Ginger has been used in Asian medicine for thousands of years. It was written about in Chinese and Sanskrit texts, and the Romans and the Greeks had a lot to say about this versatile herb as well. Europeans started to use it as a spice and condiment around the 10th century, and it was brought to America sometime during the 16th century. The Chinese used ginger to boost the heart muscle, and the Indians made tea from the leaves in order to settle the stomach. The name comes from the Gingi region of India where the plant was first grown. Ginger oil is extracted from the unpeeled roots of the ginger plant by steam distillation. The essential oil from the roots has a number of interesting chemical components, including linalool, nerol, a-pinene, camphene, geranial, b-pinene, cineole, borneol, y-terpineol, neral, geraniol, zingiberene, b-bisabolene and geranyl acetate. These chemicals give ginger oil the ability to treat colds and the flu as well as arthritis and rheumatoid pain. The oil is also used on the skin to heal bruises. The chemical compounds in ginger oil produce interesting properties: it is used as an antiseptic, laxative, stimulant, antispasmodic agent and carminative agent, as well as an analgesic, cephalic, febrifuge, rubefacient, expectorant, stomachic, tonic and sudorific agent. Ginger essential oil has been used to treat arthritis for years, especially when it is combined with eugenol. When ginger oil and eugenol are used together, their anti-inflammatory and anti-rheumatic properties produce potent results; arthritis as well as rheumatism sufferers get relief, especially when ginger oil is applied during aromatherapy. A ginger oil massage is also effective in relieving muscle aches, poor circulation, nausea, and digestive issues. Hot compresses will also make a difference, and a diluted bath with the oil from ginger relieves flu and cold symptoms when it is combined with a wellness regime. The other important factor that helps ginger essential oil maintain its status as a rock star among aromatherapy oils is its ability to blend with other oils like frankincense, bergamot, neroli, sandalwood, ylang ylang and rose. New homeopathic studies show that daily ginger oil compresses on affected joints, ligaments, and muscles will substantially ease the pain associated with arthritis as well as the pain that develops from ligament and muscle sprains. Abdominal compresses are recommended two times a week to compliment the daily compresses. These studies point out the importance of combining an aromatherapy regime with a macrobiotic diet in order to get relief from degenerative joint issues as the body ages. The bottom line when it comes to ginger oil therapy is to use it regularly, and compliment the regime with a common-sense approach to wellness. This entry was posted in Essential Oils and tagged essential oil for inflammation on April 20, 2012 by Keith Cleversley.